Расцветка: Reversible - side A "leaf pattern", side B "spot pattern". Side A: tan background, leaf pattern with 3 greens with darker colour where they overlap. Side B: tan background, spots in two colours of green and brown. 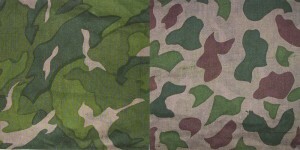 Дополнительная информация: This was the first camouflage uniform used by the PLA (People's Liberation Army). Another source state that this uniform was introduced around 1987 and that the first camouflage pattern of the PLA was a pattern resembling the British DPM more (but at a quick glance very similar to the one on this page).